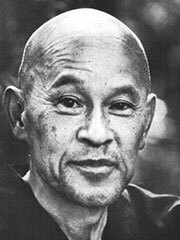 Shunryu Suzuki (鈴木 俊隆 Suzuki Shunryū, dharma name Shogaku Shunryu) (May 18, 1904 — December 4, 1971) was a Japanese Zen master of the Soto school, who played a major role in establishing Buddhism in America. The Japanese Soto-shu religious organization sent him to San Francisco, USA in 1959 to attend the needs of a small Japanese-American temple, Sokoji, in San Francisco’s Japantown. The predominantly Caucasian group that joined Suzuki to sit eventually formed the San Francisco Zen Center with Suzuki. The Zen Center raised money to buy a hot springs resort, Tassajara, which they turned into a monastery. Soon thereafter, they bought a building at 300 Page Street in San Francisco’s Haight-Fillmore neighborhood and turned it into a Zen temple. Suzuki left his post at Sokoji to become the first abbot of the first Buddhist training monastery outside of Asia. A collection of his teishos (Zen talks) were bundled in the books Zen Mind, Beginner’s Mind and Not Always So: Practicing the True Spirit of Zen. His lectures on the Sandokai are collected in Branching Streams Flow in the Darkness. Suzuki’s biography is captured in David Chadwick’s 1999 book Crooked Cucumber. I discovered that it is necessary, absolutely necessary, to believe in nothing. That is, we have to believe in something which has no form and no color—something which exists before all forms and colors appear… No matter what god or doctrine you believe in, if you become attached to it, your belief will be based more or less on a self-centered idea. Whereever you are, you are one with the clouds and one with the sun and the stars you see. You are one with everything. That is more true than I can say, and more true than you can hear. Suzuki, Shunryu (1970). Zen Mind, Beginner’s Mind. Weatherhill. ISBN 0-8348-0079-9.